"All the buzz" in England is the birth of a new member of the royal family, Her Royal Highness Princess Charlotte Elizabeth Diana of Cambridge. Born last Saturday in London, she will be known as Princess Charlotte of Cambridge, officials at Kensington Palace announced. She is fourth in line for the throne. But over at the 140th annual Dixon May Fair (May 7-May 10), you'll see another kind of buzz, another kind of palace and another kind of royalty. The Buzzingham Palace will be buzzing. It's a bee observation hive belonging to the Honey and Pollination Center, UC Davis. Looking through the glass, fairgoers can observe a colony in action--the queen laying eggs, worker bees (females) tending to her every need and the needs of the colony, including the drones (males). 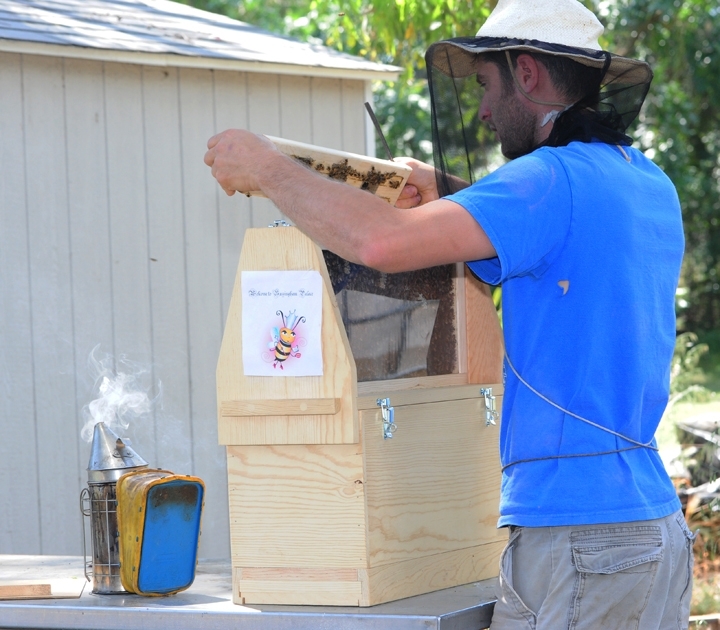 The bee observation hive is a product from Mann Lake, Woodland, said.Amina Harris, who directs the Honey and Pollination Center. 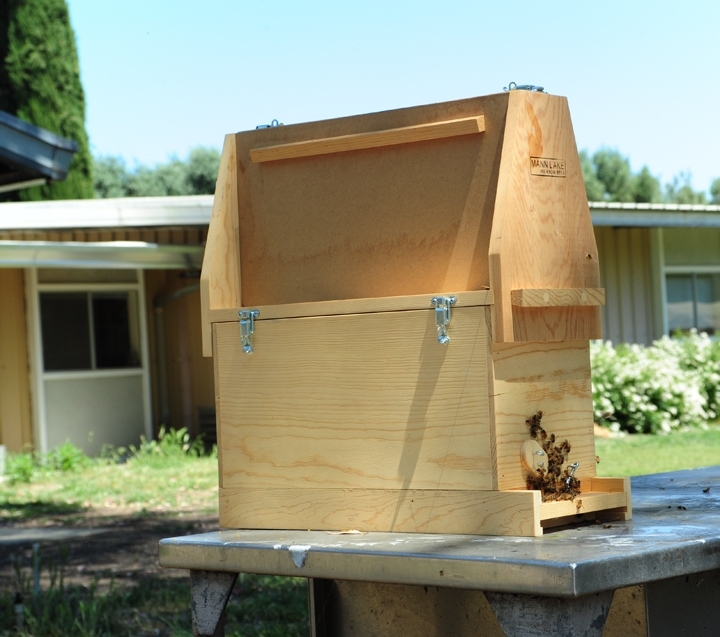 The bees were donated by Ray Olivarez of Olivarez Honey Bees, Orland. 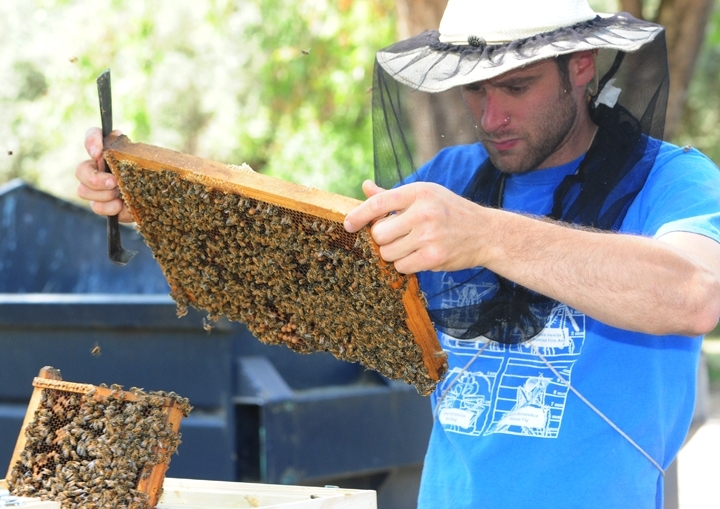 Staff research associate Billy Synk of the Harry H. Laidlaw Jr. Honey Bee Research Facility, part of the UC Davis Department of Entomology and Nematology, is tending the bees in the Buzzingham Palace. 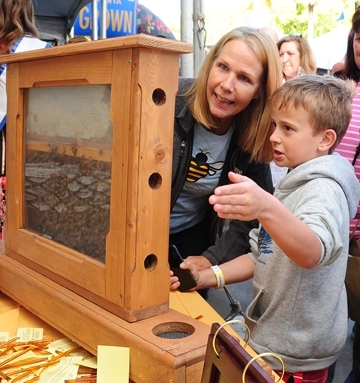 The observation hive will be showcased inside a booth in the Southard Floriculture Building along with posters, photos and scientific information about bees from the UC Davis Department of Entomology and Nematology. Entomologists and graduate students from UC Davis will staff the booth. 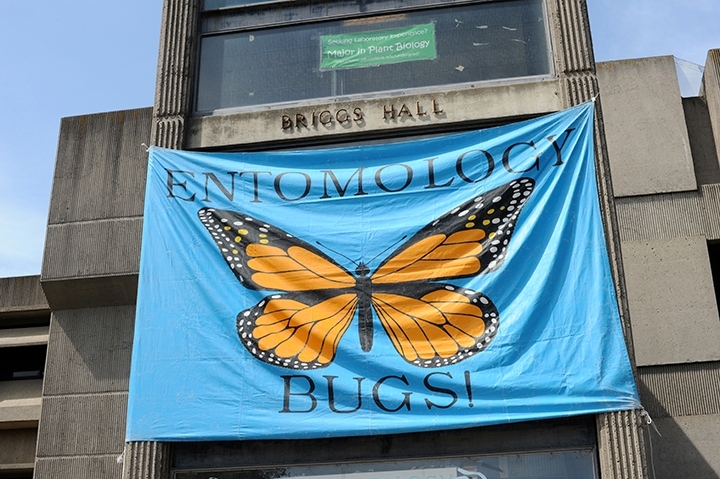 Among them will be entomologist Jeff Smith, an associate at the Bohart Museum of Entomology, who will talk about insects and spiders. Fairgoers can hold Peaches, a rose-haired tarantula; walking sticks, and Madagascar hissing cockroaches. Want to see Buzzingham Palace, hold Peaches and talk to the entomologists? 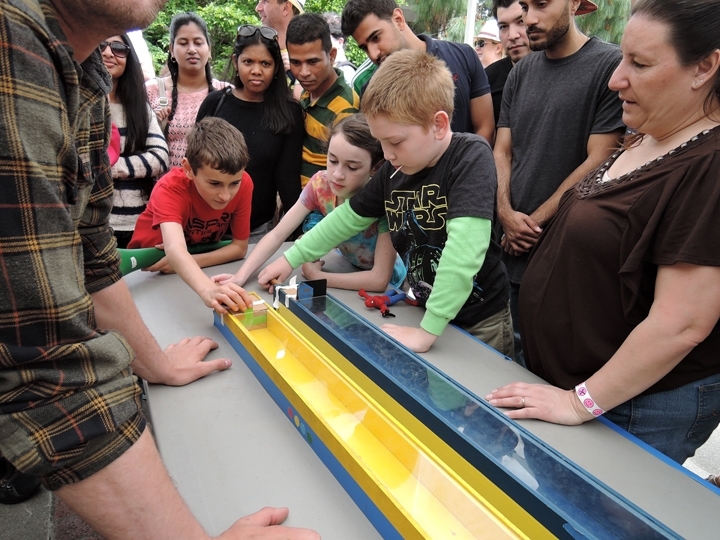 Thursday, May 7: 4 to 11 p.m.
Friday, May 8: Noon to 11 p.m.
Saturday, May 9: 11 a.m. to 11 p.m.
Sunday, May 10: Noon to 11 p.m.
For more information check out Dixon May Fair's "Fair at a Glance." Meanwhile, the Buzzingham Palace is buzzing! Visitors at the annual California Agriculture Day, held Wednesday, March 18 on the west lawn of the State Capitol, made a beeline to the California State Beekeepers' Asssociation (CSBA) booth to see the bees, pocket some honey sticks and talk bees. 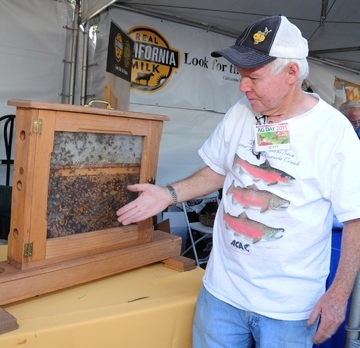 Staffing the booth were five beekeepers and Extension apiculturist emeritus Eric Mussen of the UC Davis Department of Entomology and Nematology, who retired last June after 38 years of service, fielded lots of questions. 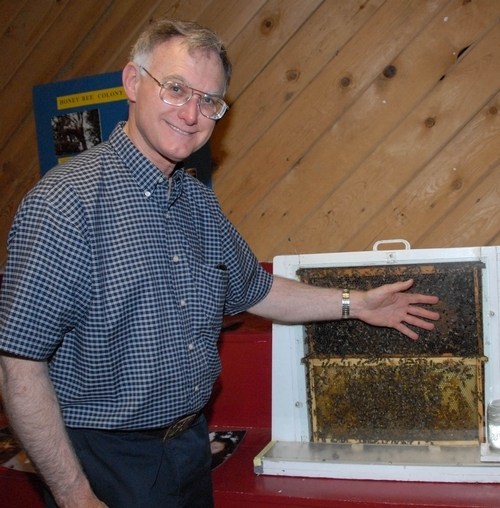 Bill Cervenka of Bill Cervenka Apariies, Half Moon Bay, provided a bee observation hive. 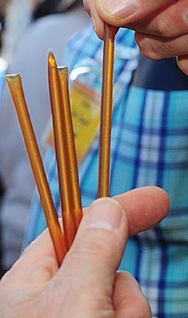 Carlin Jupe of Sacramento, secretary-treasurer of the CSBA, brought along 2000 Honey Stix containing wildflower honey, ordered from Nature's Kick, Salem, Ore. Assisting throughout the morning were beekeepers Bob Sugar, Wendy Mather and Claudia Parrish. Mather, of El Dorado, is with the NOD Apiary Products; Sugar belongs to several beekeeping associations, including CSBA, the Sacramento Area Beekeepers' Association (SABA), Nevada County Beekeepers, and the Western Apicultural Society, while Parrish serves as vice president of the Delta Bee Club. "I spent quite a bit of time on 'How do I keep bees in a thirty-third floor apartment with no balcony?'" Mussen related. "I sent a number of people to the Sacramento Beekeeping Supply store to find an opening in beginning beekeeping courses. I spent time explaining the bee space and how to keep purchasing wooden ware from the same supplier, so the space would not be violated." Folks also wanted to know how the drought is impacting the bees. State Senator Jim Nielsen "wanted to know that he kicked up enough of a fuss to get agriculture a place at the water conference table. Up until then, no ag reps were desired." 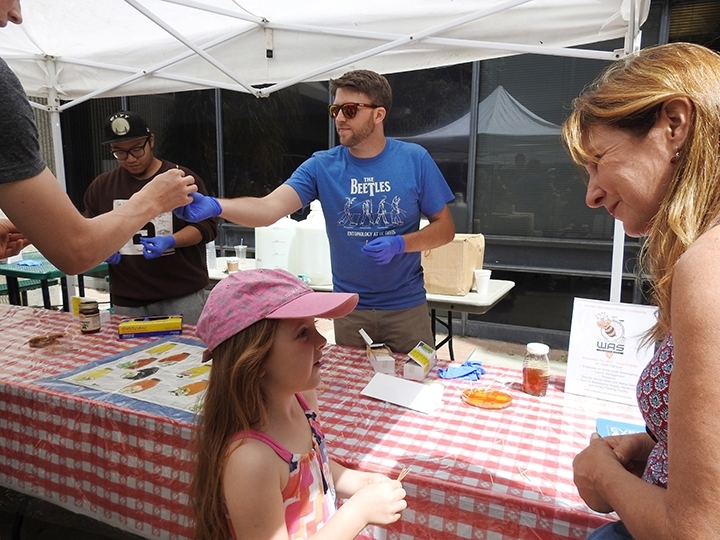 Eight-year-old Sam Blincoe of Sacramento took a special interest in the bee observation hive, as Mather explained what the bee colony is all about. "He's going to become a beekeeper," she predicted. 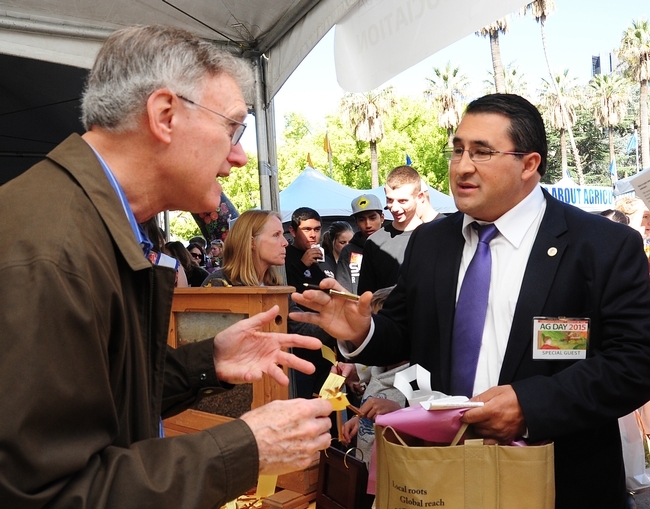 "Breaking New Ground" set the theme for Cal Ag Day. Explained Secretary of Agriculture Karen Ross: 'Growing our food supply takes seed and water, labor and treatment, and a host of other ingredients that all come together at harvest time. But when you get right down to it, our soils are the foundation of California's agricultural abundance. That's why this year's Ag Day event features information about our farmers and ranchers' efforts to preserve, restore and protect the health of this most bsic and most important source." The theme, she added, "also reflects the United Nations' declaration of 2015 as the International Year of Soils to increase awareness and understanding of the importance of soil for food security and essential ecosystem functions." She concluded: "Our legislative representatives here in Sacramento recognize the importance of farming in the Golden State, and they also recognize farmers' responsibility to be good stewards of the natural resources under their care. Today is our representatives' chance to shake a farmer's hand and advance our shared understanding of the importance of our food supply. 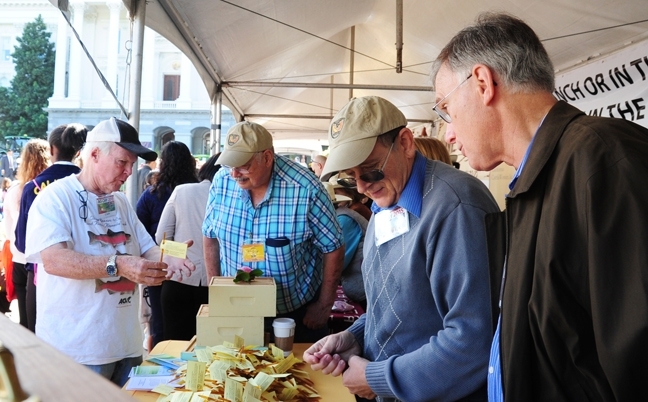 This day is also an opportunity for the public, especially our youth, to meet a farmer, try on a cowboy hat, and learn how California's soil and other natural resources are combined with creativity, technology, ingenuity and determination to produce more than 400 crops and commodities." Meanwhile, California Farm Bureau Foundation president Paul Wenger issued this statement today, the first day of spring: "On this first day of spring, we celebrate the agricultural bounty of our nation and especially of California, where a unique combination of climate, soils, water and know-how allows farmers and ranchers to harvest food and farm products every day of the year. While parts of our nation continue to shiver in cold and snow, California provides, thanks to one of only five Mediterranean climates in the world. As we celebrate this bounty, we must also resolve to assure we can sustain it. As California suffers through another year of drought, we must pay particular attention to our state's ability to manage the rain and snow that does fall each winter, to sustain us through dry times. Farm Bureau will continue to press our leaders, at the local, state and national levels, to assure sustainable food production by building new water storage and better managing the entire water system, to ensure California remains the No. 1 agricultural state in the nation." Pull up a chair and engage in a little "girl-watching." 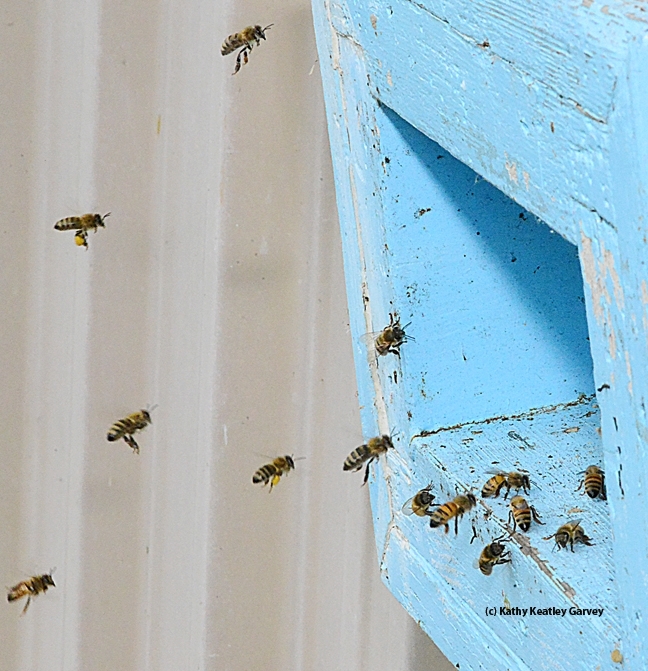 That is, honey bees heading home to their colony. 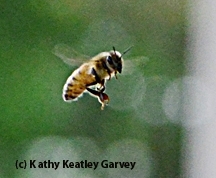 Many beekeepers, especially beginning beekeepers, like to watch their worker bees--they call them "my girls"--come home. They're loaded with pollen this time of year. Depending on the floral source, it may be yellow, red, white, blue, red or colors in between. 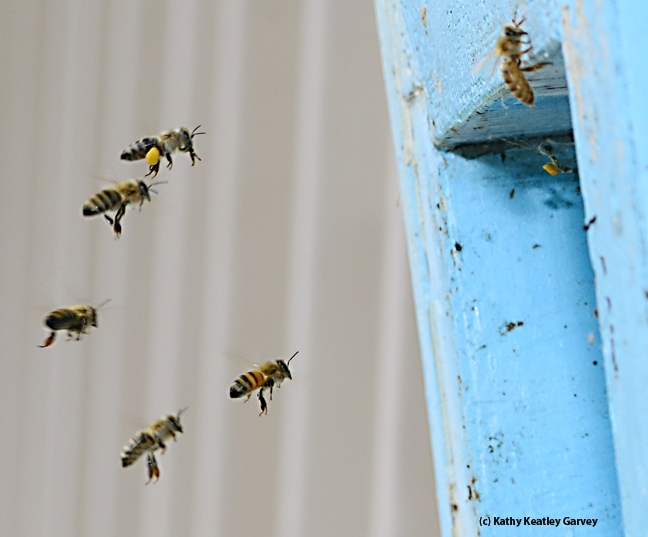 Below, the girls are heading home to a bee observation hive located inside the conference room of the Harry H. Laidlaw Jr. Honey Bee Research Facility on Bee Biology Road, University of California, Davis. They're bringing in food for the colony: pollen and nectar. They also collect water and propolis (plant resin). This is a matriarchal society where females do all the work in the hive. 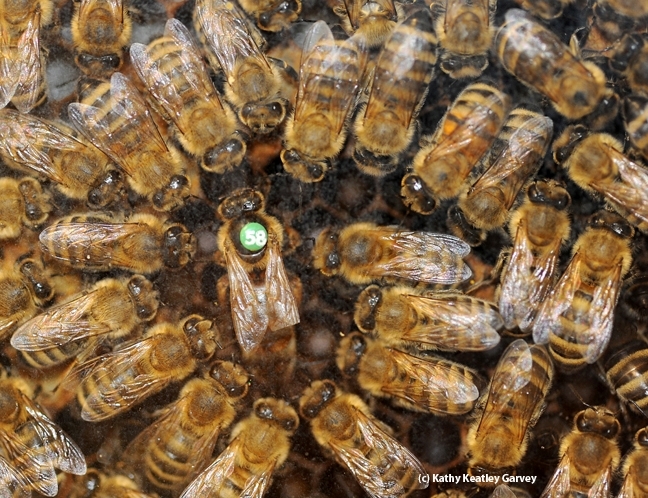 The worker bees--aptly named--serve as nurse maids, nannies, royal attendants, builders, architects, foragers, dancers, honey tenders, pollen packers, propolis or "glue specialists," air conditioning and/or heating technicians, guards and undertakers. 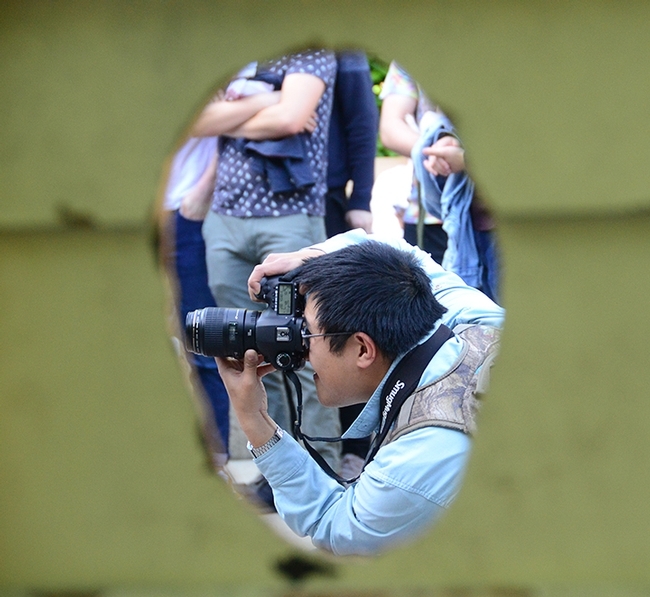 The glassed-in bee observation hive is indeed a popular and educational attraction to watch the queen lay eggs (she'll lay about 2000 eggs a day during peak season), the comb construction, honey production, pollen storage and all the other activities. 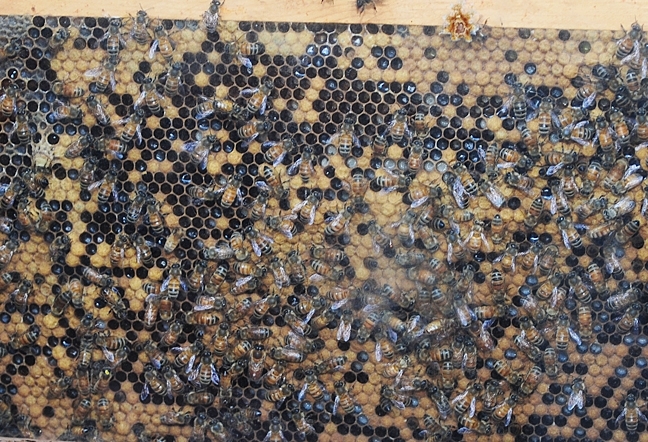 The sisters feed the colony, including the queen and their brothers (drones). A drone's responsibility is solely reproduction, and that takes place in mid-air when a virgin queen takes her maiden flight. After mating, he dies. Done. That's it. Meanwhile, life continues inside the hive. A honey bee exhibit at the 133rd annual Dixon May Fair featuring Cooperative Extension Apiculturist Eric Mussen has just won a top regional honor. The exhibit, housed appropriately in the floriculture building, won second place in the Western Fairs’ Association’s non-competitive exhibit category. WFA represents fairs and festivals in 27 states and Canada. 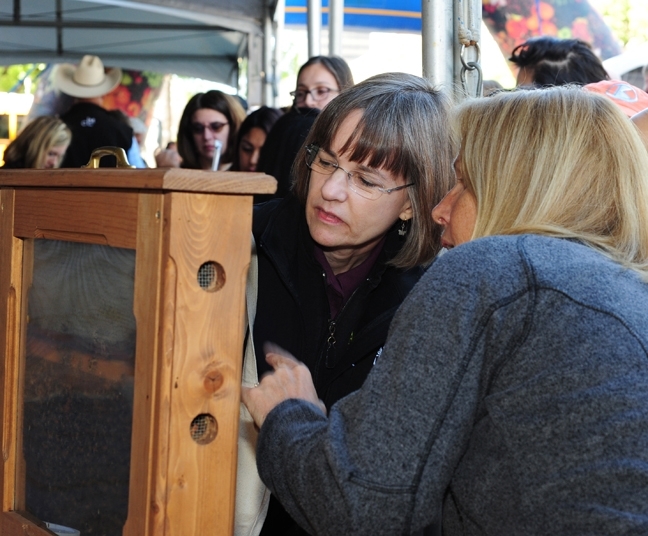 “The honey bee exhibit was a first at the Dixon May Fair and very popular,” said Ester Armstrong, the fair’s interim chief executive officer. “Dr. 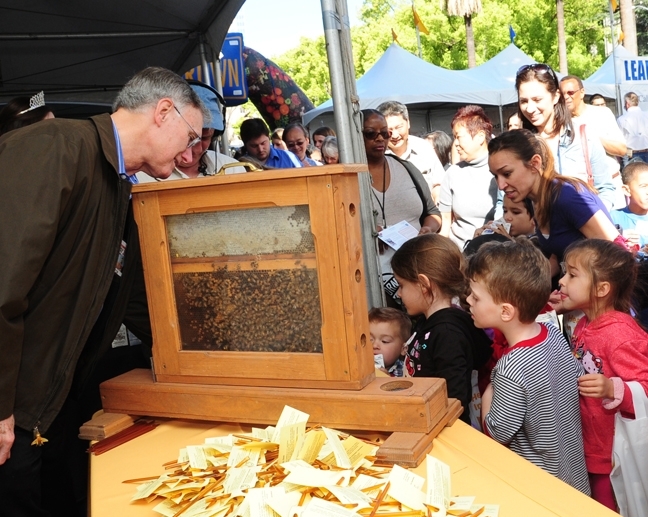 Mussen drew large, interested crowds, all wanting to know about the plight of the honey bee.” A record 89,000 attended the four-day fair, the oldest running fair in California. Mussen, a University of California apiculturist and member of the UC Davis Department of Entomology faculty for the past 32 years, fielded questions from fairgoers. 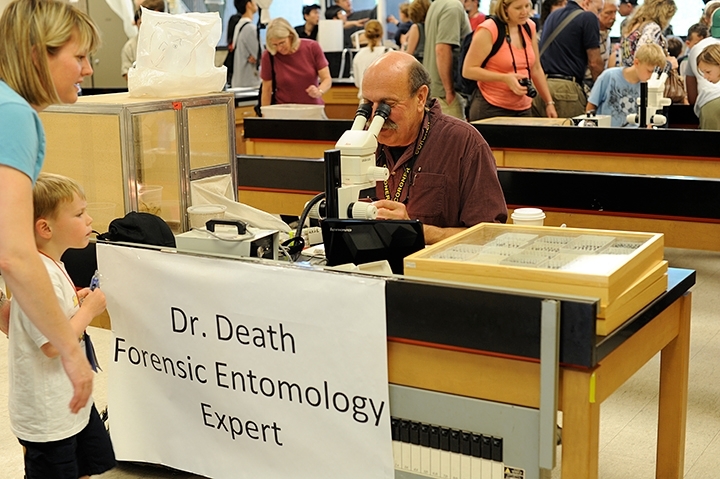 He also provided educational displays of bees and beekeepers. 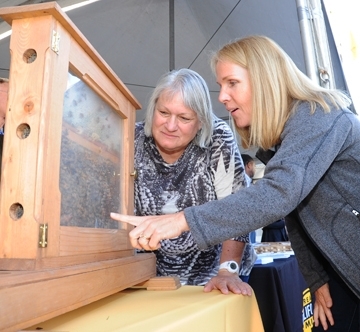 Bee breeder-geneticist Susan Cobey, manager of the Harry H. Laidlaw Jr. Honey Bee Research Facility at UC Davis, and research associate Kim Fondrk loaned the fair a bee observation hive, a glassed-in facility showing the queen bee, workers and drones. 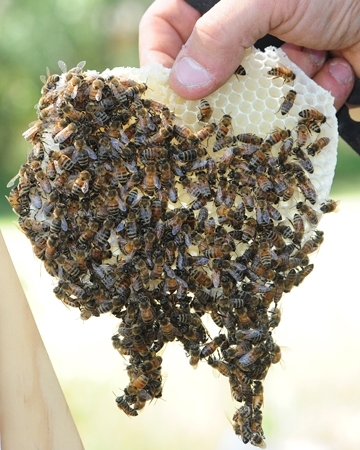 Over the last two years, individual beekeepers have reported losing 30 to 100 percent of their bees due to a mysterious phenomenon known as colony collapse disorder. 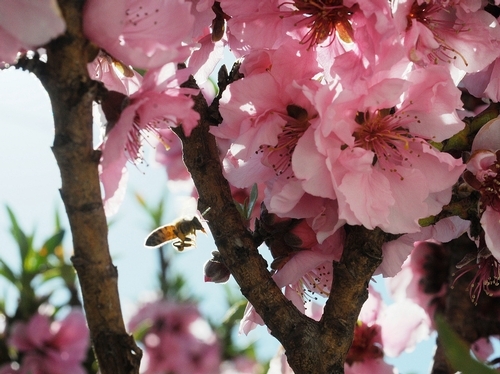 Honey bees pollinate one third of the American diet. 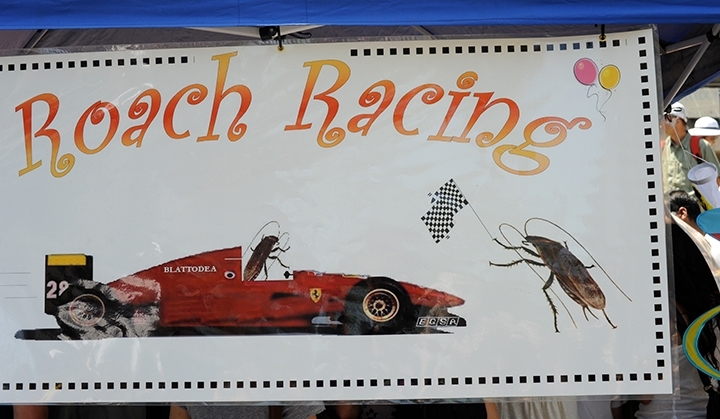 Another popular UC Davis exhibit at the fair: live insects provided by the Bohart Museum of Entomology, which houses the seventh largest insect collection in North America. Brian Turner, public outreach coordinator at the Bohart Museum displayed Madagascar hissing cockroaches, Vietnamese walking sticks, tarantulas and millipedes. The Bohart Museum, housed in Academic Surge on the UC Davis campus, is dedicated to teaching, research and public service. 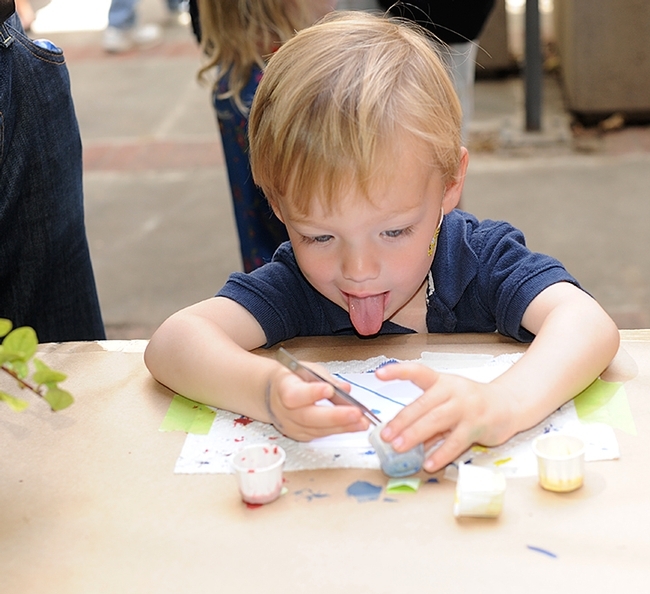 Both UC Davis exhibits will return to this year’s fair, set May 7-10 at 655 S. First St., Dixon. It makes sense that one of the oldest insects should be at the state's oldest fair. . The oldest known bee, found encased in amber in Burma, is thought to be 100 million years old. The specimen is at least 35 to 45 million years older than any other known bee fossil, scientists say.